In 2002 there was a partial solar eclipse in Sydney (it was a total eclipse in South Australia, and guy from work made the trek out to see it there). I only had my Olympus point and shoot digital camera at the time, and no filters. So I wasn't expecting to get any decent photos of it. 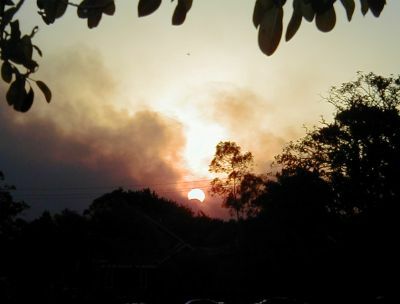 But as it happened there were bushfires around Sydney that day, and smoke from one of them obscured the sun enough to let me see and get photos. I did consider trekking to the US to see the total eclipse in a couple of weeks.. but it wasn't exactly practical heh. I don't even think it's feasible to go downstate to Edwardsville where there is supposed to be 100% obscurance and you're considering crossing an ocean. Craziness.